New data and imagery will help professionals in many sectors. Subscribers have unlimited access to aerial/satellite imagery on-screen and in PDFs. Special subscription add-on packages of workforce reports are available. New features available for subscribers to Business Analyst Online, Esri's Web-based analysis tool, include unlimited use of imagery from i-cubed, an Esri Business Partner, and special add-on packages of labor force and skills data reports compiled from information provided by another Esri Business Partner, Workforce Strategies, Inc. This new data and imagery will help professionals in commercial real estate, retail, economic development, urban planning, and public safety organizations, as well as other industry sectors, conduct even more comprehensive market analyses. 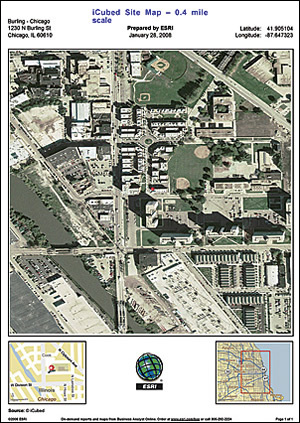 This image of Chicago illustrates the detail that can be obtained from using i-cubed high-resolution imagery. 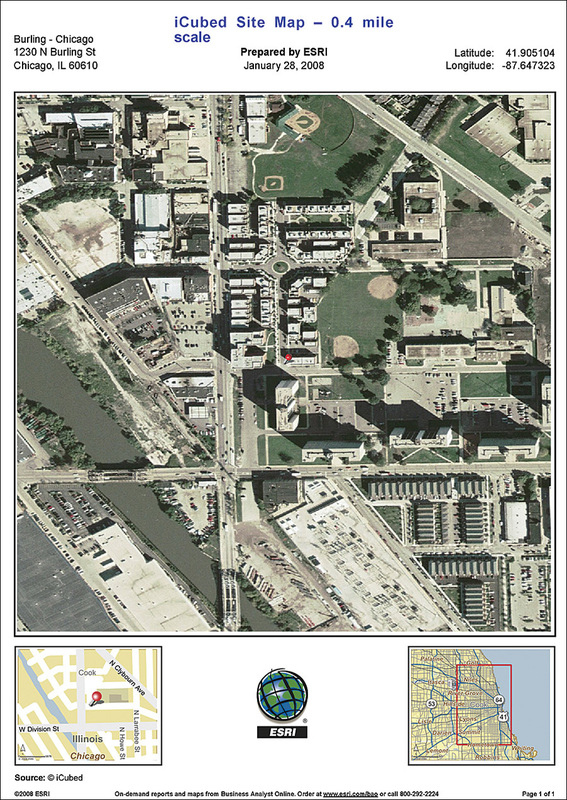 To provide an additional perspective of current and potential sites, high-resolution imagery is available at distances of 1.4 miles, 1.5 miles, and 1.8 miles and by trade area. A geoprocessing service organization, i-cubed offers complete business solutions based on information and geodata derived from aerial photos, satellite imagery, and other sources of geographic information. Imagery from GlobeXplorer and Pixxures, both Esri Business Partners, can be purchased by all Business Analyst Online users. GlobeXplorer images are available for more than 98 percent of the continental United States at various resolutions. Pixxures imagery is available for more than 88 U.S. markets. The Workforce Foundation packageUnlimited use of three reports will provide an overview of an area's workforce. The Workforce Executive packageUnlimited use of six skills reports, occupation profiles, and the Workforce Profile can provide a more in-depth analysis of a workforce. The Workforce Executive Pro packageUnlimited use of 18 skills, occupations, and workforce profile reports can provide a comprehensive view of the labor force in any U.S. area. 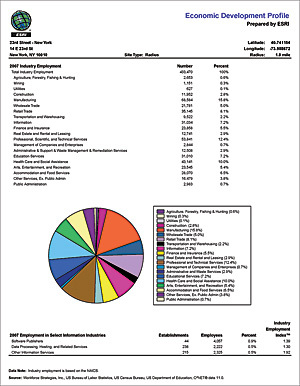 The Economic Development Profile report is among those available in the optional labor force packages for Business Analyst Online subscribers. Comprehensive workforce and skills data for the United States provides a detailed view of local workforce populations and types of labor available by employee demographics, skills, training, experience, and occupations. Thirty reports, including six for skills, are available to all users of Business Analyst Online and include information about occupational categories, workforce preparation, education, county-level poverty rates, and county-level wage data. Workforce Strategies, Inc., an experienced provider of workforce and labor market data for more than 20 years, provided the information for these reports. Analysts in all types of industry sectors can use this data to identify labor shortages and increased competition for workers, create strategies to optimize an area's labor force, better understand a local labor force, and market the strengths of a local labor force by its skills. "This information will be invaluable to our subscribers, enabling them to make even better business decisions that can improve their efficiencies and grow revenues," says Brenda Wolfe, Business Analyst Online product manager, Esri. For more information about Business Analyst Online, visit www.esri.com/bao or call 1-800-447-9778.